What are the technical specifications of our Latex Rubber Tubing? The physical characteristics listed below are the properties of Kent Elastomer's natural rubber latex tubing. Latex-Tubing.Com is proud to offer Kent Elastomer's product on our website. The buyer must perform all tests necessary to confirm whether the product and its performance and qualities are suitable for the intended application. Final determination of fitness of the product for the intended application is the buyer's responsibility. 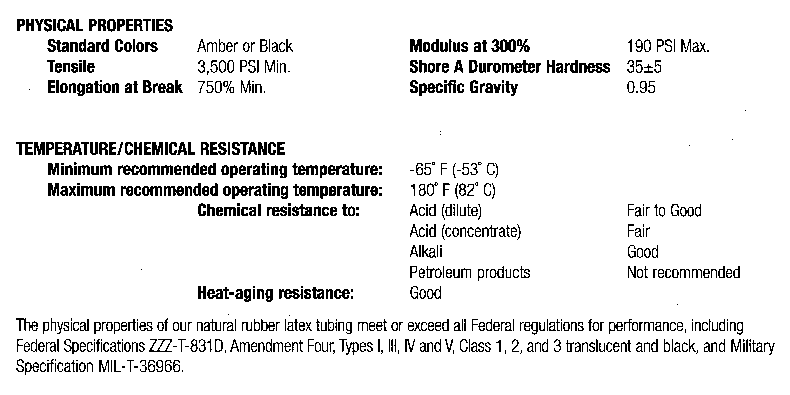 Kent Elastomer and Latex-Tubing.Com shall not be liable for any misuse or misapplication of their product.